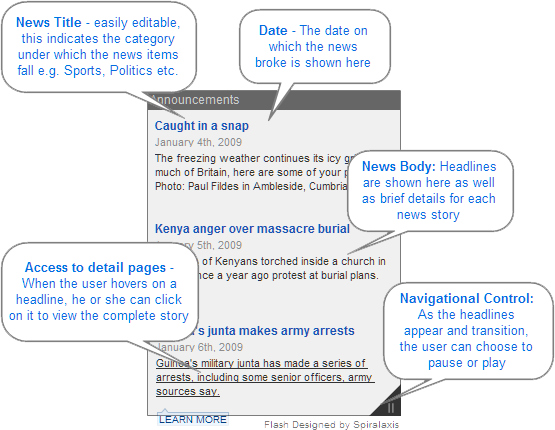 The Flash Scrolling News component allows the user to display news headlines on a web page, with the ability to determine the number of headlines that should be displayed, and access to complete stories upon clicking each news headline. A gradual transitional effect allows the headlines to fade in and fade out, and the ability to pause or play the transition of the headlines is provided. This component can easily be deployed on any web page and will function exactly as shown here. An external CSS link is provided to alter the attributes of the hyperlinks or the look and feel of the page e.g. font size, font color etc. This feature allows the user to pause and play the news headlines that appear within the scrolling news component. The component has been designed so that the user makes changes to it dynamically. However, user interface controls have been provided if the user wishes to customize the application in appearance. Ability to merge with any Template. The main news title is the category by which the news items are represented. The news items can be classified as "Announcements" as in this particular case, or they could be categorized as News, Sports etc. depending on the user's preference. This represents the date of publication of the news, or when the news story broke. This section of the news component consists of the actual news headlines and brief excerpts of the respective news stories. The headlines are displayed one at a time, using a gradual transitioning effect, which are easy for the user to view. Pause and Play controls are available for the user to determine if the news headlines should continue to change, or remain still. By default, the headlines will continue to transition and change. If the pause icon, which is placed at the bottom right of the news screen is clicked, the headlines will come to a standstill. A Play icon will appear, which if clicked will allow the headlines to begin changing and transitioning again. Since this is a free version of the flash scrolling news component, made available to users as a free download and evaluation copy, copyright information for Spiralaxis is displayed at the bottom in a subtle manner, to express the proprietary rights of the company that has designed the product, and provided access to this free flash scrolling news component. This feature provides the facility to add any number of news items as practically possible. This feature allows a smooth and gradual transitioning effect, which is user-friendly and appealing to the eye. It allows enough time for the user to read the headline and brief excerpt provided, without any abrupt transitioning effects which can disrupt the user experience. Each headline and its relevant text are hyperlinked to detailed pages where the complete text for the respective news story is available. This gives the user the additional ability to alter the content even in the details pages if needed. To be merged with any Template. This component has been created in such a way that enables the user to install and deploy it on any website where it will function exactly the same way as shown in the demo, regardless of where and how the webpage is hosted or designed. This is the date of publication of the news, or the day when the news story broke. This area contains the actual news headlines. Each headline is displayed one at a time, with its respective date displayed to the left. The headlines change slowly and gradually through a fade in, fade out transition effect. The site provides a hyperlink to the detailed pages where complete text is available for the relevant headline being displayed on the scrolling ticker. This enables the user to alter the content in the detail pages as well, if required. This component has been created in such a way that allows it to be used on any web page and still function in exactly the same manner regardless of the where the component are will be embedded and deployed. The headlines change and transition through a subtle fade in and fade out effect. This is one of the best features of the flash news ticker component, since it is not only aesthetically pleasing but overall creates an appealing user-friendly experience, without any distracting or abrupt transitional effects. This version of the flash news ticker component is available as a free download, and serves as an evaluation copy for the user. For this reason, copyright information is displayed in a non-intrusive manner in the bottom right area below the news ticker component. This feature enables the user to add as many news items as required.